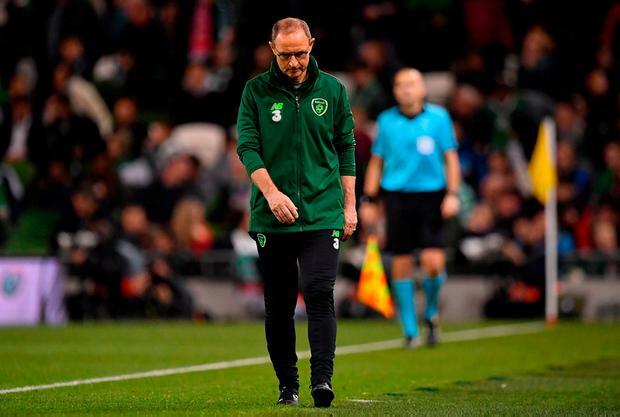 Martin O'Neill is today fighting to stay in his job as Ireland manager after his side were outplayed and outwitted at home to Wales last night. The Irish are rooted to the bottom of the Nations League table, and are in danger of relegation to League C, after a 1-0 loss last night. Derby County man Harry Wilson scored the only goal of the game on 58 minutes and Ireland, with one point from three games in the Nations League, are at rock bottom, an added blow as James McClean will miss next month's tie away to Denmark due to suspension. A shapeless Ireland side struggled to put passages of play together, with the puzzling decision to take off the impressive Callum Robinson with half an hour to play. O'Neill's position is now under intense scrutiny with the very real prospect of a wooden spoon finish in the group table. The 66-year-old is under contract with the FAI until 2020 and he has stated his desire to see out his contract and try to lead the team to the Euro 2020 finals, Ireland one of the joint-hosts of that tournament. There would be a massive financial hit for the FAI to axe O'Neill and his coaching staff, paid an estimated €3million a year, but another defeat in Denmark next month would surely see the axe fall on the Derry native.